Install the WinTV-GO2 in your PC and you're ready to watch TV in a resizable window, right on your PC screen! 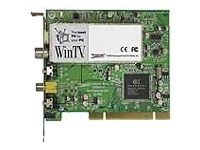 WinTV offers features usually only seen on high-end television sets, like previewing 16 channels at once. And it goes further! Snap and print stills from whatever you're watching. Or record video clips from your camcorder or off the air to create your own high-impact presentations. And with Hauppauge's WinTV SnapShot application, you can capture still video images in adjustable high-resolution modes to 1600x1200 pixels!